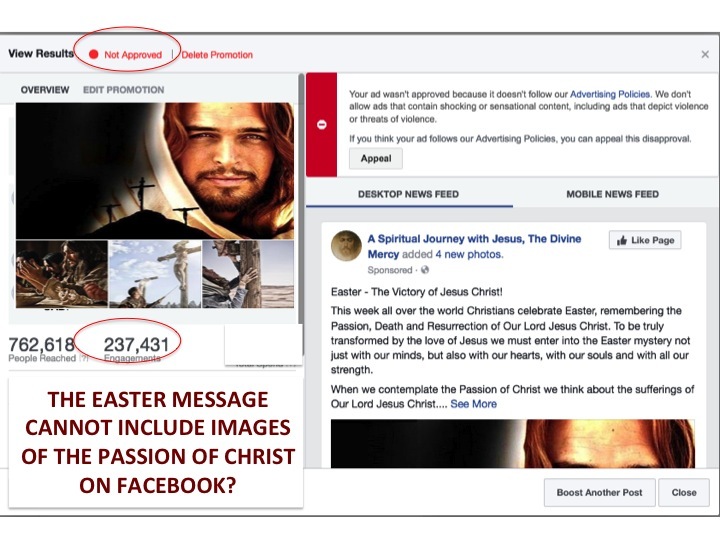 Passion Of Christ » Will the Future of Facebook Include Jesus? There are growing concerns about what the future of social media will look like. Will it be open or highly censored; will it be considered a safe place for youth; will people feel included or disenfranchised; will it truly reflect public opinion or will social media be an incarnation of the views of its content moderators? I am also the administrator of this page passionofchrist.ca. 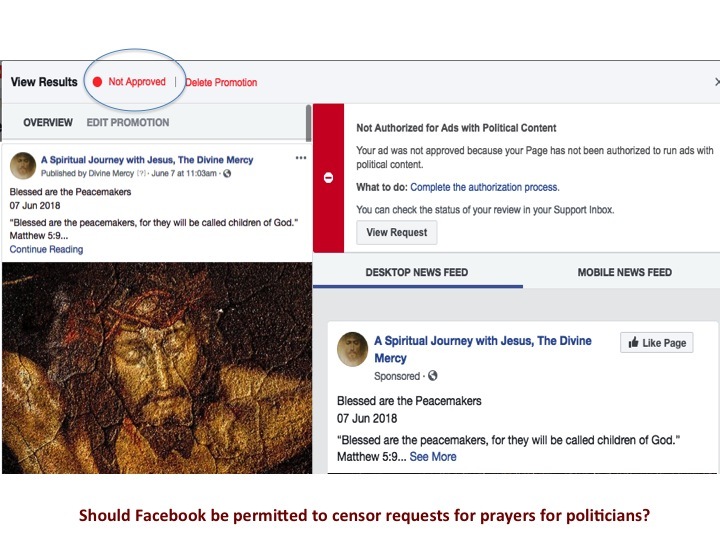 I am VERY concerned about the censorship of Christian content on Facebook. There are three serious issues: censorship, reduced reach and content disappearing. 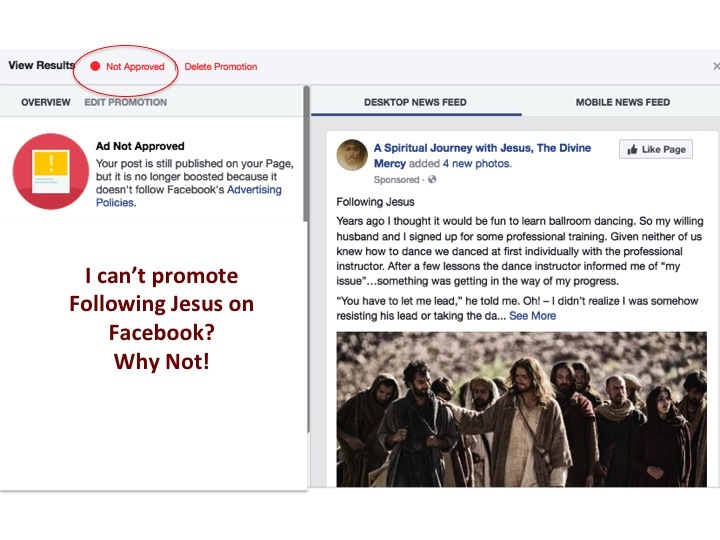 Many of the Christian posts (Spiritual reflections on the Word of God) that were successfully promoted in 2017 on my Facebook page have been rejected for subsequent promotion. 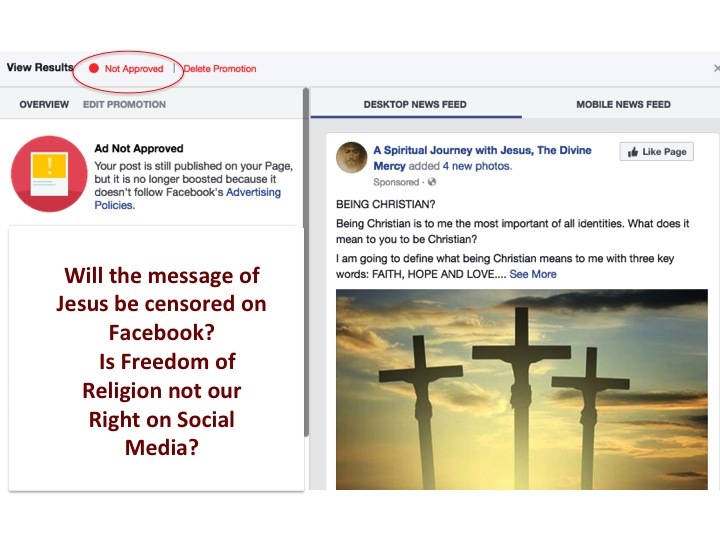 Ads not approved include titles like “Following Jesus”, “Being Christian”, “Are you being deceived by the devil?”, “The Open Door to Heaven”, “Easter – The Victory of Jesus Christ” etc. On July 26th, 2018 I shared a post entitled Renewing the Face of the Earth. This post presents ideas that could change the world! 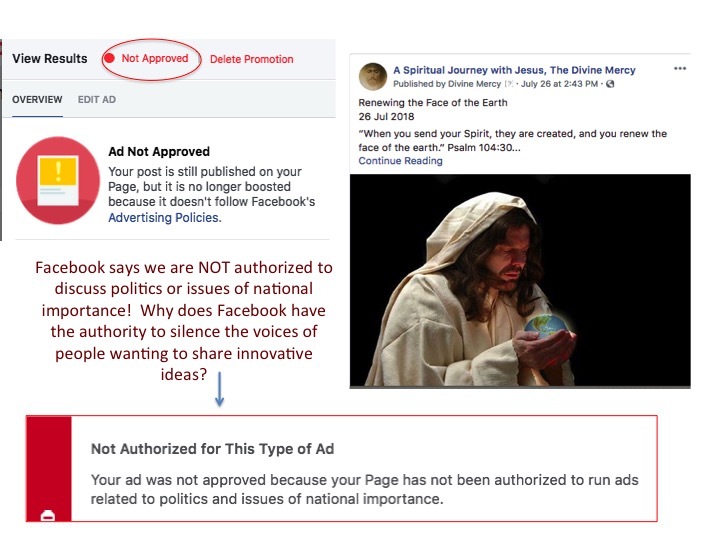 Facebook refused to promote this post because we were told we were NOT authorized to promote ads related to politics or matters of national importance! Who is authorizing Facebook to silence the voices of innovation? 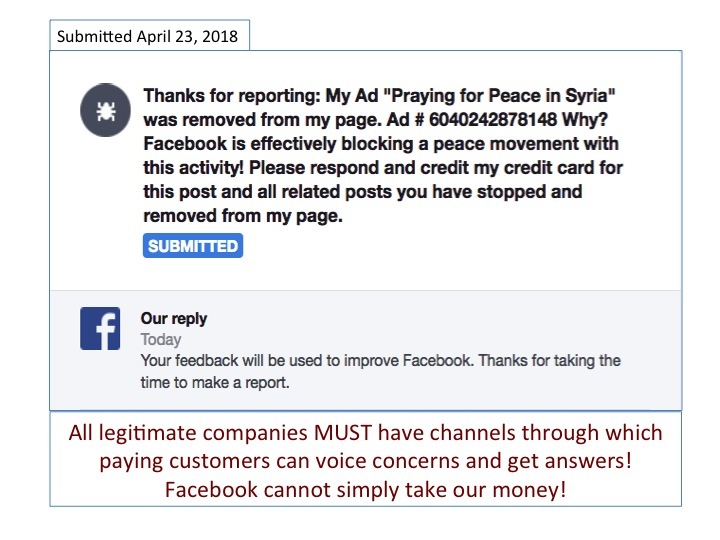 On April 16th, 2018 I posted “Praying for Peace in Syria” on my Facebook page. It was promoted throughout the week, my credit card was charged for the advertising expenditures and on Monday April 23rd, 2018 I noticed that the post was removed entirely from my page! No explanation was offered by Facebook as to why this post was taken down and when I try to seek answers I am ignored. All I get is a computer generated message – see below. These rejected posts have received millions of ‘likes’ on Facebook from people all over the world. 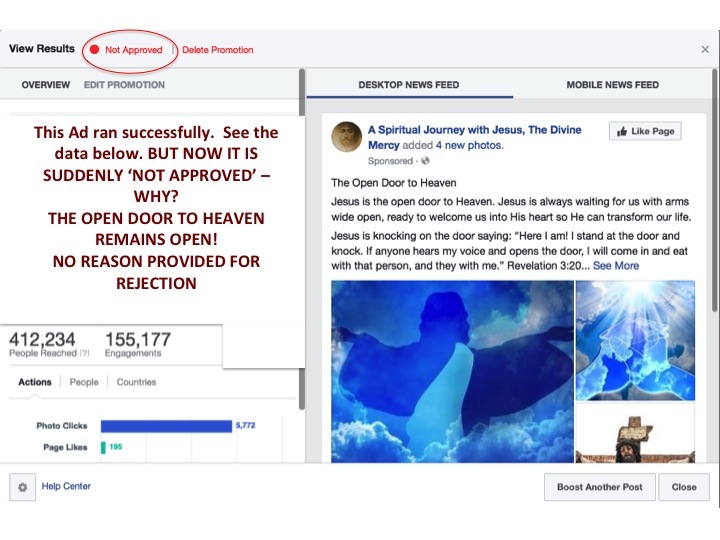 As you can see from the screen shots in some cases we have been given a reason for the rejection and in other cases no reason for the rejection of this ad content is provided. 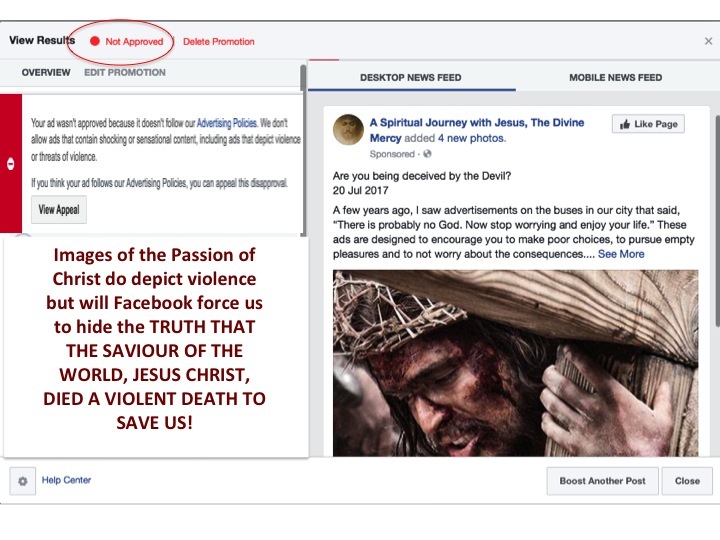 Facebook is taking exception to some of the images of the Passion of Christ we are using, calling them ‘violent’, but that’s the TRUTH OF WHAT HAPPENED TO JESUS. HE SUFFERED A VIOLENT DEATH BY CRUCIFIXION TO SAVE US FROM OUR SINS. 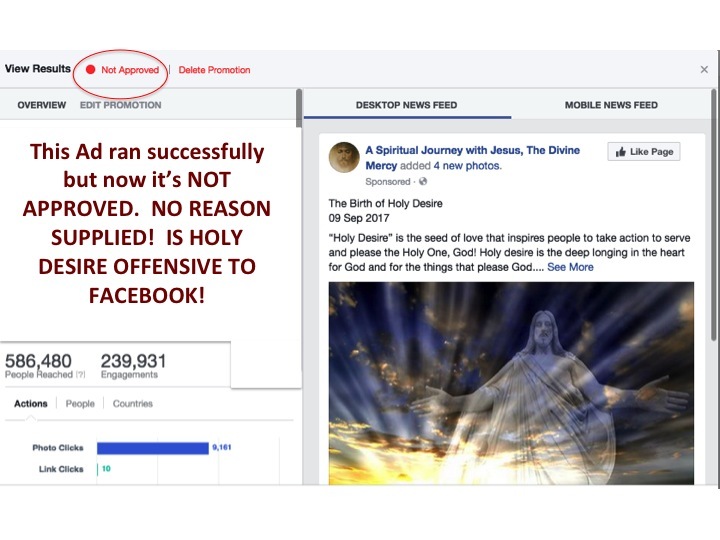 WILL FACEBOOK CENSOR THE TRUTH? AD REACH IS WAY DOWN! 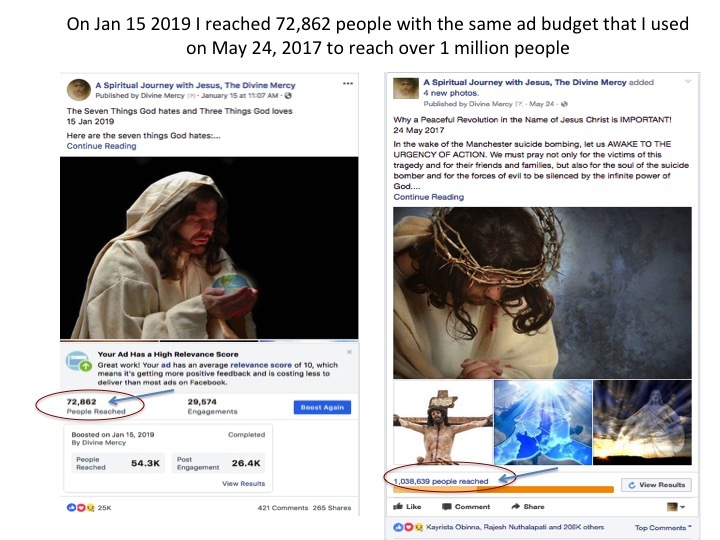 The problem with respect to reach is that for the same level of advertising investment in 2018/2019 I am seeing a huge reduction in the number of people I can reach as compared to 2017. In general I am now getting a small fraction of the reach I was getting in 2017. 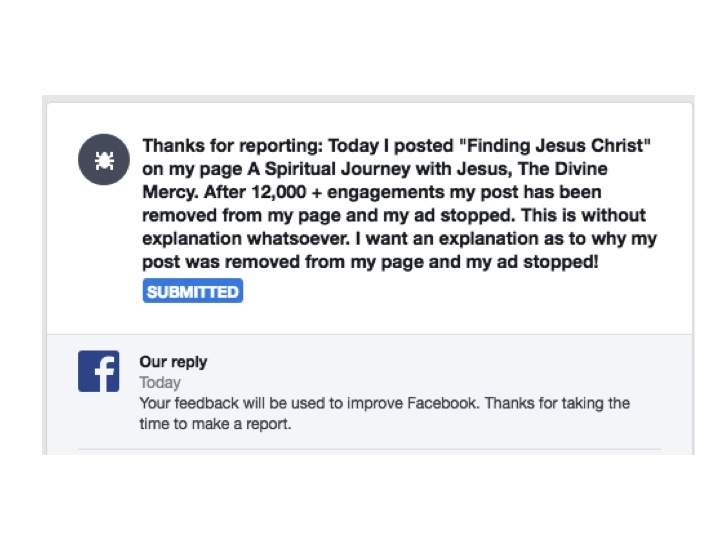 I went back to Facebook to report the issue but I was told my Case concerning missing posts is CLOSED and via the online Facebook reporting tool I get the following computer generated response. I have not received a response to my letter. 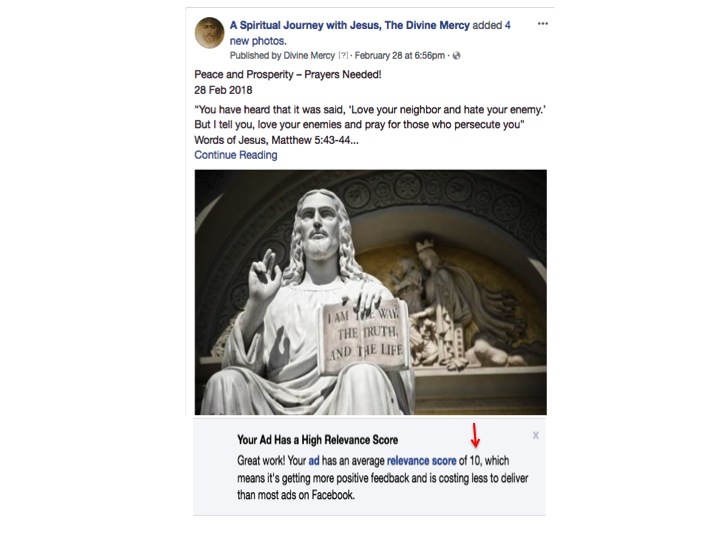 CENSORING A SPIRITUAL JOURNEY WITH JESUS, THE DIVINE MERCY IS BAD BUSINESS FOR FACEBOOK! I worked in the IT network industry for over twenty-five years. I am a professional marketer. I have read in the news that large corporate advertisers like Unilever have told Facebook to “drain the swamp”. The Christian content I am sharing is NOT part of the swamp! We attract people that want to learn about Jesus and as Christians we are a large, attractive market for credible businesses. 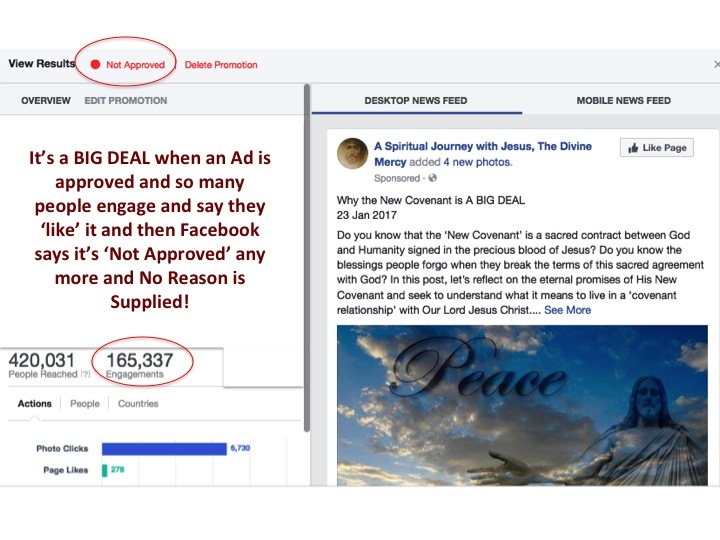 Facebook’s large corporate advertisers need fan pages like A Spiritual Journey with Jesus that keep people engaged and satisfied on Facebook! 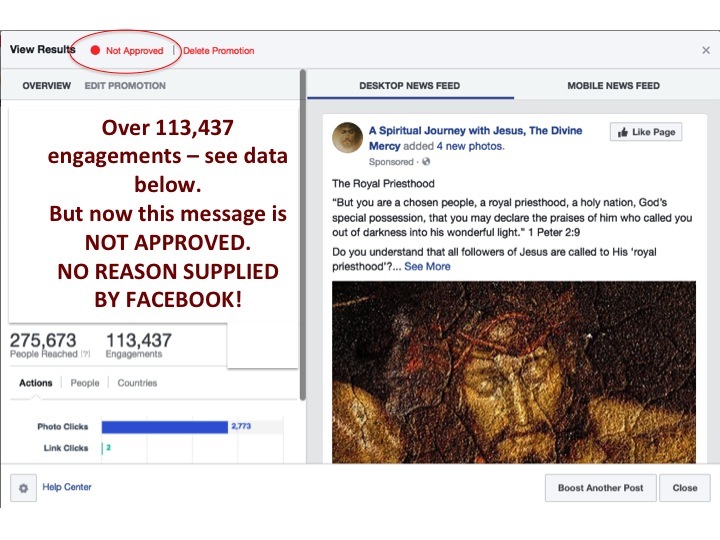 It’s bad business for Facebook to censor the message of Jesus and this bad business practice will likely result in people and corporate sponsors leaving the platform! Facebook will also likely be sued for discrimination if this doesn’t stop! Networks don’t tend to censor content unless the content is endangering someone or the content is considered of no value to the community like ‘fake news’. I am promoting the message of Jesus, which is peace and love, so needless to say that’s as good as it gets! 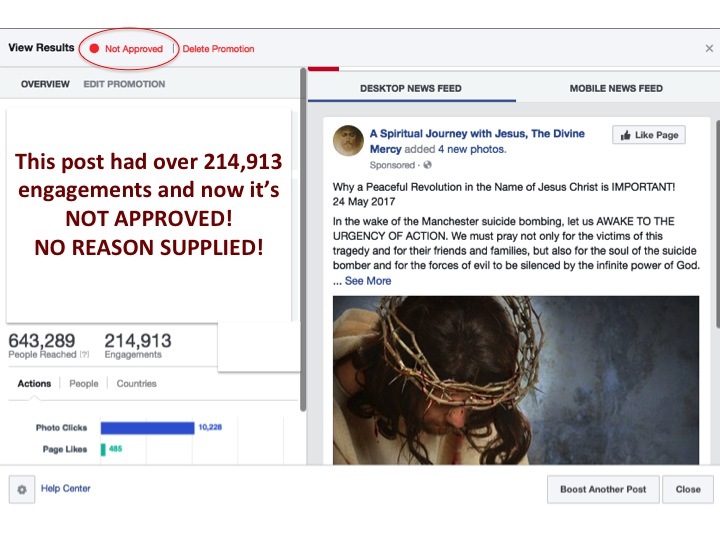 I am also promoting a peace movement called A Peaceful Revolution in the Name of Jesus Christ to try to end violence and promote peace in our world but notice in the following screen shot that my promotion is now in the Facebook “Not Approved” bucket! What’s going on! 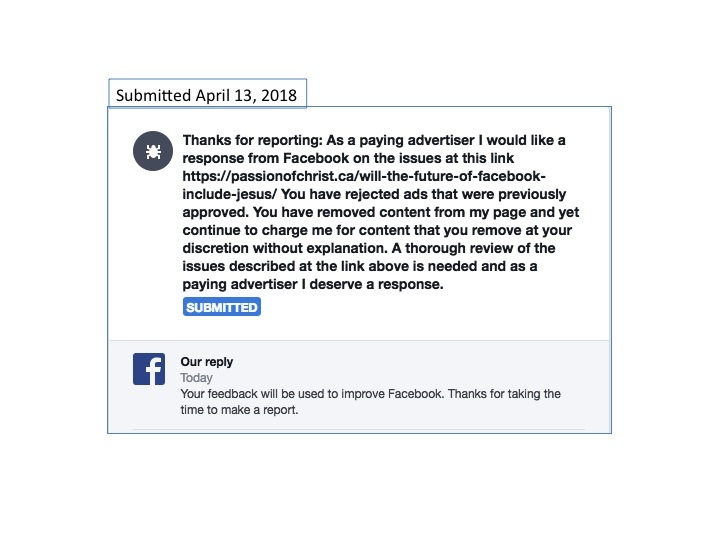 I have tried for many months to communicate with Facebook because I want to work out a problem that is affecting many Christian advertisers but I have not succeeded in convincing Facebook to change their practices. Smart companies don’t ignore big market opportunities! There are billions of Christians in the world and many of us want to connect with one another and share our faith in Jesus Christ. Our presence on Facebook is something positive. I have told Facebook that I want to be a positive contributor. 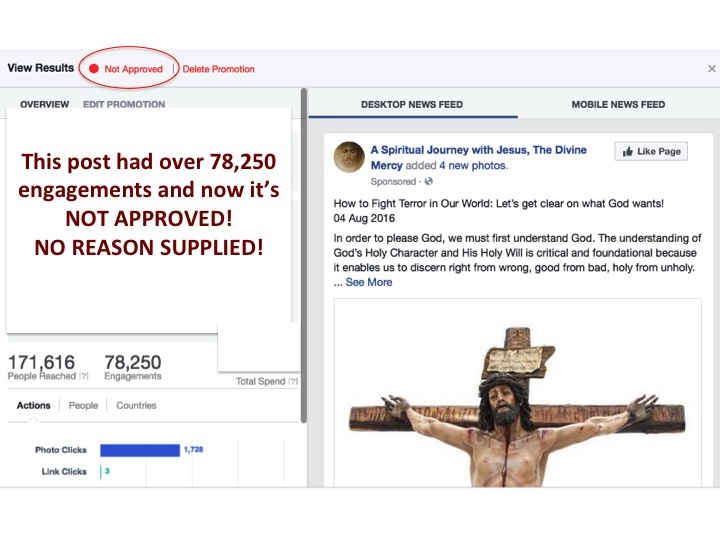 Our posts have received the highest relevancy rankings that Facebook gives and they have been ‘liked’ over sixteen million times so the public has communicated their support and the content should not suddenly be rejected by Facebook and it should not be taken down at their discretion! 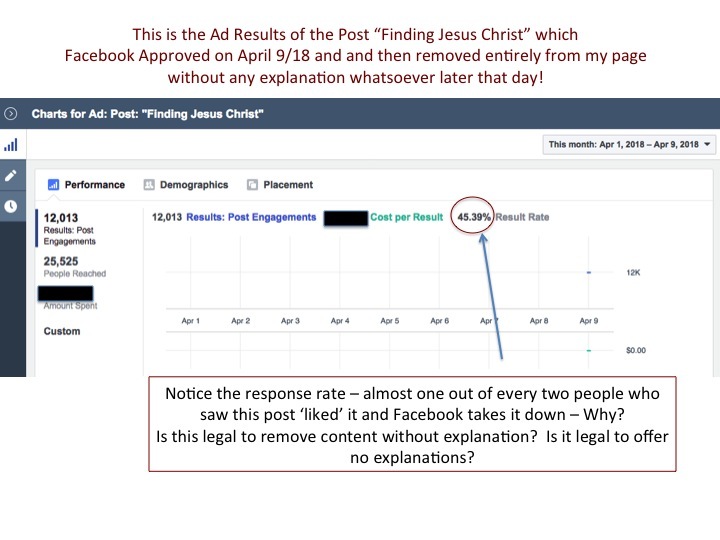 On April 9th, 2018, I posted “Finding Jesus Christ” on my Facebook page. It was approved for promotion and within hours over 12,000 people had engaged. 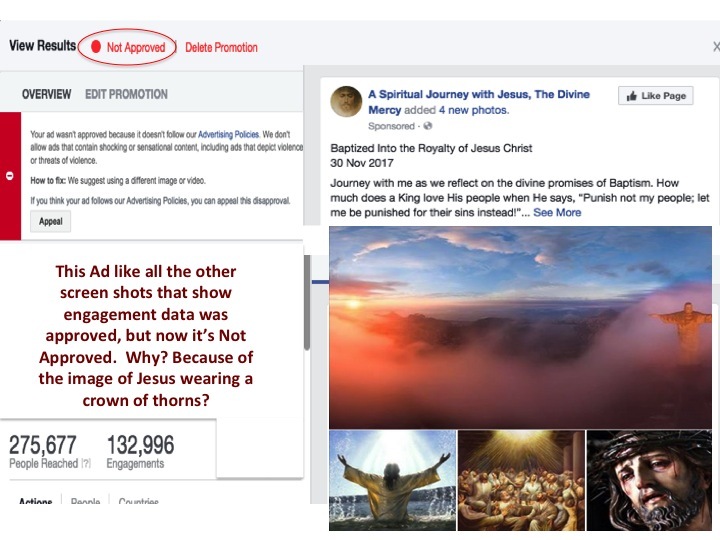 On the evening of the same day I checked on my post and Facebook had not only stopped the Ad, they had also removed the post entirely from my page. 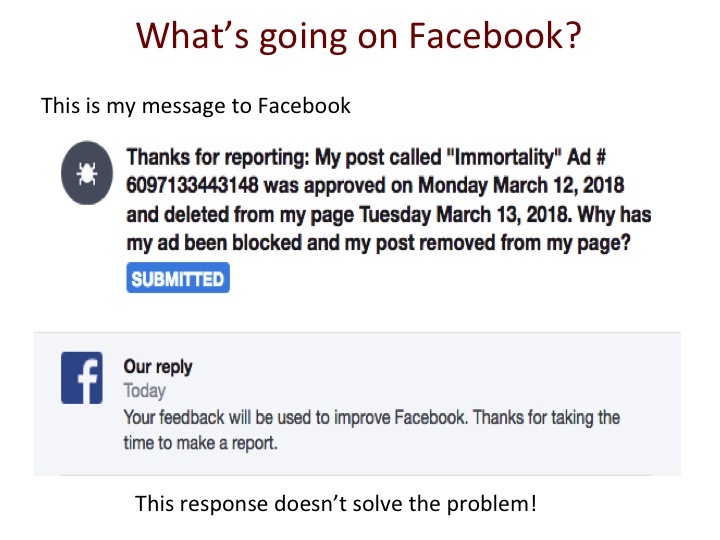 When I inquire about what’s going on all I get is a computer generated message that is effectively Facebook ignoring the problem. 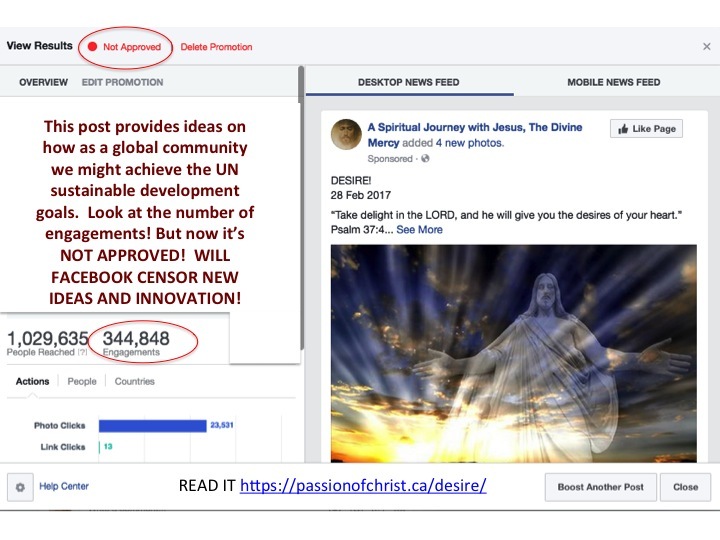 In each post I promote on my Facebook page I am promoting a grassroots, global Christian peace movement called A Peaceful Revolution in the Name of Jesus Christ. 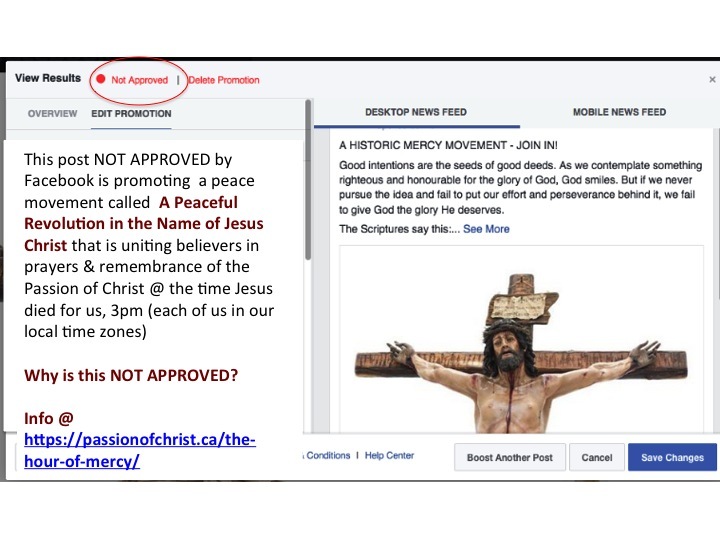 Will Facebook obstruct the promotion of a peace movement? The following screen shot shows the kind of response rate this post was getting, over 45%! Do we need a legal precedent to stop this injustice? For those interested I offer some new ideas on a future vision for social media for the well being of all. This is a new vision for the future of social media where concerned connected citizens can really MAKE A DIFFERENCE! These ideas are based on over twenty-five years working with some of the biggest network providers in the world. I think the opportunity social media executives need to think about is how to leverage the connected community to identify and address issues and deliver new value. The network increases in value as the network community grows IF the connected community is working together to filter out problems like fake news, violence and extremism. For example, consider the case of 19 year-old Nikolas Cruz, recently arrested for the school shooting in Florida. State prosecutors are now seeking the death penalty. There were warning signs all over social media of the threat of violence. On YouTube Nikolas Cruz declared his intention to be “a professional school shooter”. The YouTube comment was reported to FBI, but the FBI was reported as saying they could not identify him from his online profile. I am advocating for an ‘Emergency Response’ solution on social media where the connected community can report someone of concern to an emergency response team. What I am suggesting goes beyond the reporting features currently available on social media. Facebook is hiring a large number of content moderators but the size of this team cannot compare to the opportunity of putting emergency reporting tools in the hands of the connected community that is now over two billion. What I am suggesting is something similar to a ‘911 emergency response functionality’ where someone online can trigger an alert that goes to a online dispatcher. The dispatcher receiving the alert would decide how to intervene. Now critics might say that this will result in a lot of ‘fake emergencies’ and it will likely lead to some until people start losing their access privileges and recognize the need to be responsible in using this feature. Consider the possibility that an emergency response capability existed to alert the social media Emergency Response team that Nikolas Cruz appeared to be a high risk individual. The emergency response alert could have dispatched an online ‘distress counselor’ to try to engage Nikolas in an attempt to make a meaningful connection to help him get on a productive, nonviolent path. I have worked in municipal distress centers as a telephone counselor. What I am proposing is not far fetched. Distressed people like to talk to people willing to listen. Nikolas Cruz may have been willing to talk anonymously to someone trained to help and he may have even been willing to speak to someone in person after engaging with an online counselor and establishing a degree of trust. In the municipal distress centers I worked in we were mostly unpaid, well trained volunteers. In a social media context where communication is in writing it is very easy to monitor ‘distress interventions’ to ensure quality interactions. Caring people need to get involved to help make the future of social media bright! Consider the possibility for caring people to become NEW SOCIAL MEDIA LIFELINES! Consider the possibility that someone alone and struggling could proactively connect to a ‘counselor online’ for emotional support. Once again these lifelines would be authenticated and police checked. This type of social media ‘lifeline’ connection could prevent a crime or a suicide! There are so many ‘lifelines’ that could be enabled by connecting individuals with authenticated, credible members of the connected social network community for issues ranging from help with school homework, to spiritual and psychological support, to help getting a job or advancing one’s career. Obviously this type of future requires vision and some infrastructure to enable people to come together safely in new configurations. It requires a community service mentality where social media becomes a place where members of the public can connect with concerned members of the connected community. All companies must offer a help desk function where paying advertisers can voice their concerns and get answers. The response below is NOT ACCEPTABLE! It is NOT LEGAL TO TAKE PEOPLE’S MONEY AND NOT RESPOND TO CONCERNS! All legitimate companies MUST have help-lines where paying customers can get issues resolved!